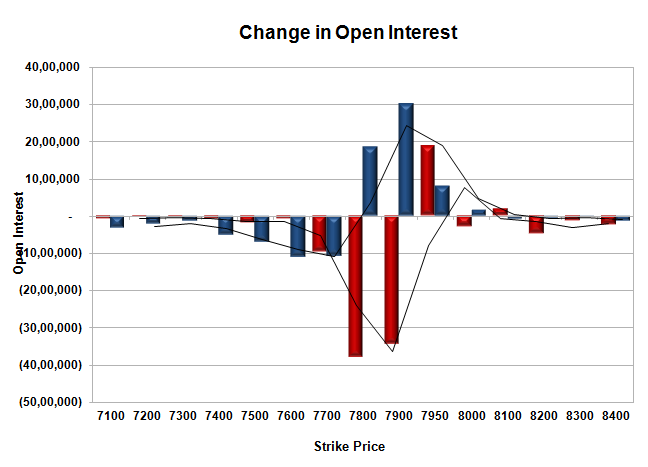 The index opened flat to positive and went on to make a high around 8200 but closed midway at 8178.50, gain of 21.85 points. The broader market was negative with 775 advances to 790 declines. Range at the start of the series comes to 7900-8400. Call option 8300-8700 added 12.48 lacs OI with short covering at 8100 and below strike prices. 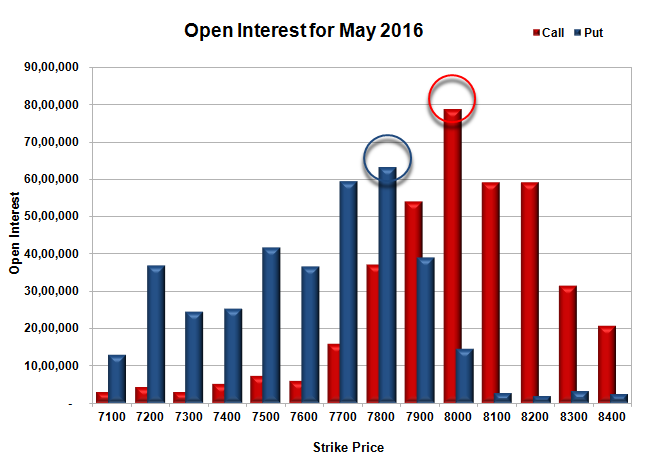 Put option 8500-8000 added 29.67 lacs OI with profit booking at 7900 and below strike prices. 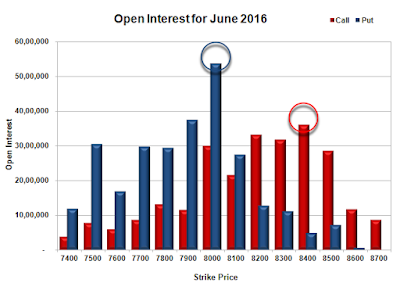 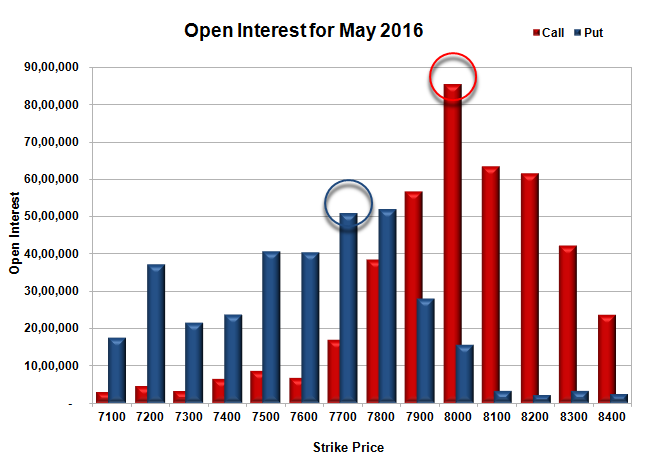 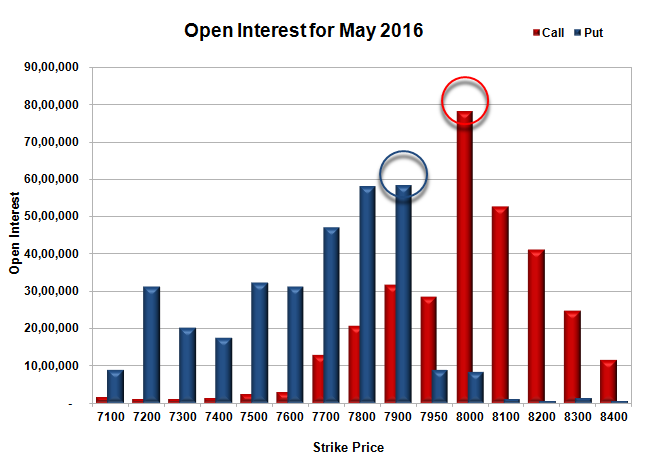 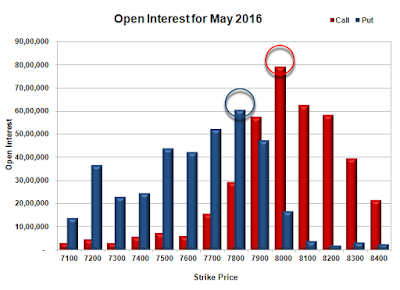 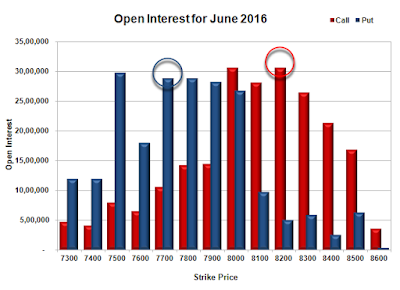 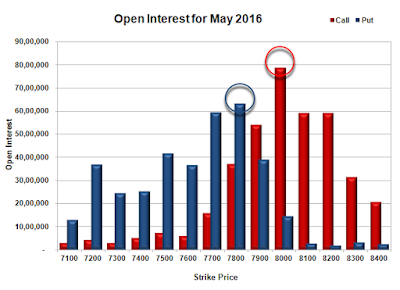 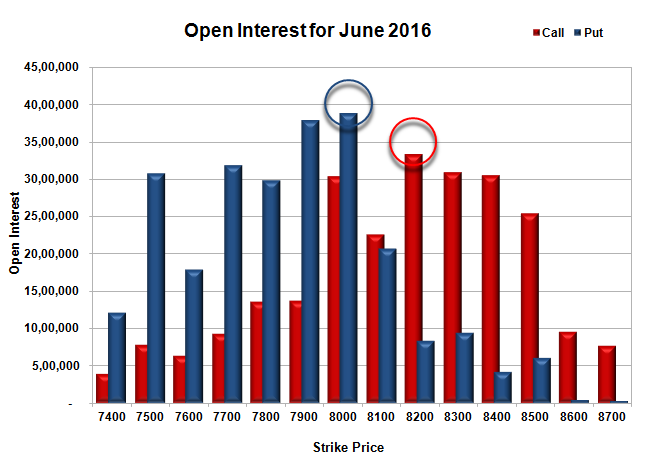 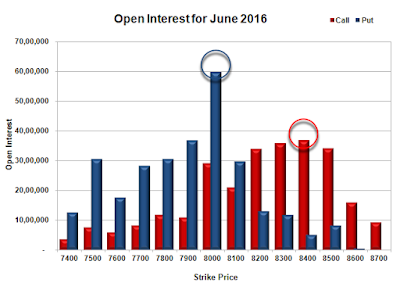 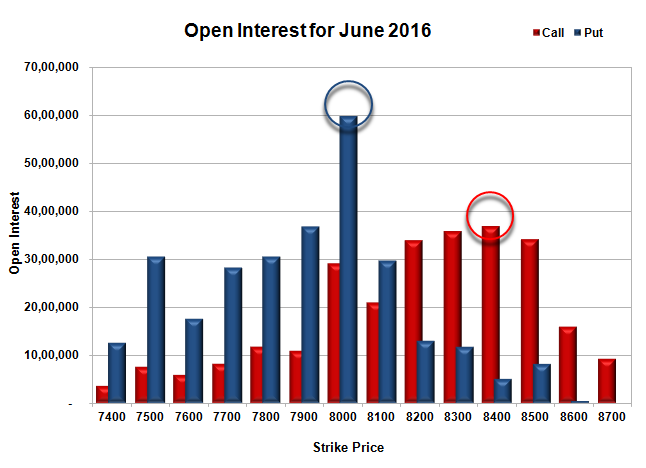 Nifty Open Interest is at 2,16,95,850 up by 7,57,950, with increase in price, probably huge long build-up. Bank Nifty Open Interest is at 17,04,930 down by 35,640 with no change in price, probably long liquidation. 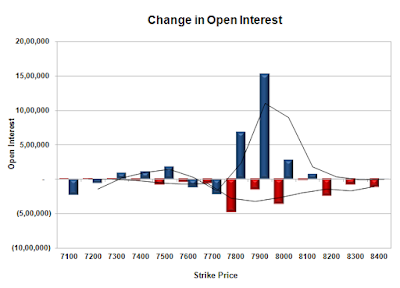 FII’s bought 9170 contracts of Index Futures, which includes net 11457 contracts long build-up and 2287 contracts short build-up, with increase in net OI by 13744 contracts, includes 31189 longs to 22019 shorts for the day. 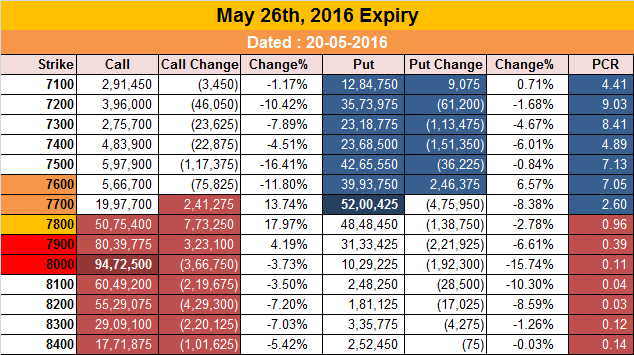 FII’s Index future open contract as on date is 242259 Longs to 53335 Shorts, Net 188924 up by huge 9170 contracts. Initial support at 8100, with huge OI addition of 6.75 lacs and below that at 8000 with highest OI of 53.70 lacs. 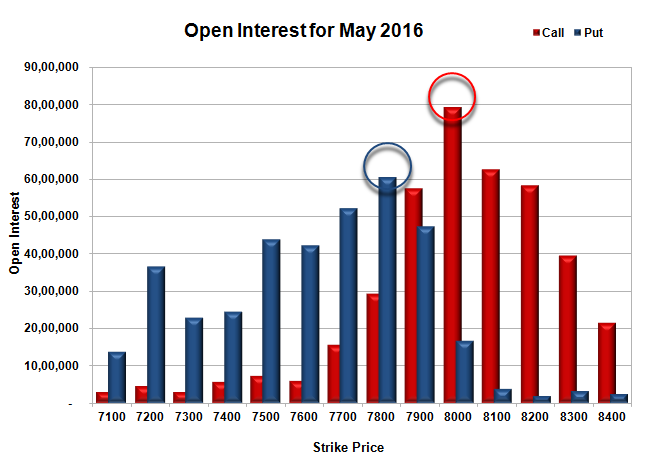 Initial resistance at 8200, with OI of 33.19 lacs and above that at 8300 with OI of 31.70 lacs. 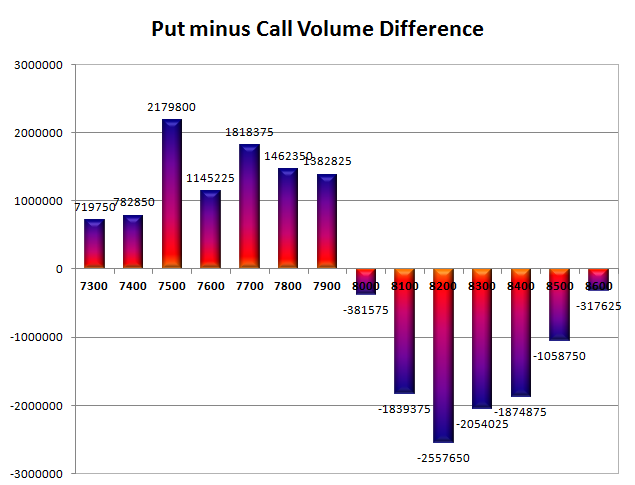 Day Range as per Option Table is 8105 - 8247 and as per VIX is 8110 - 8247 with 8176 as the Pivot. 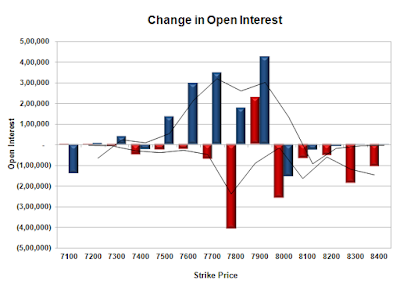 The index opened strong above 7800 and stayed strong, toppling one resistance after another to close near the highs of the day at 7934.90, huge gain of 186.05 points. 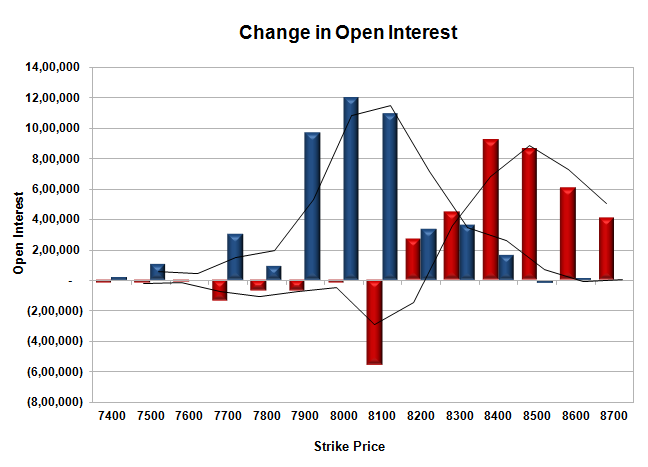 The broader market was strong with 1073 advances to 471 declines. 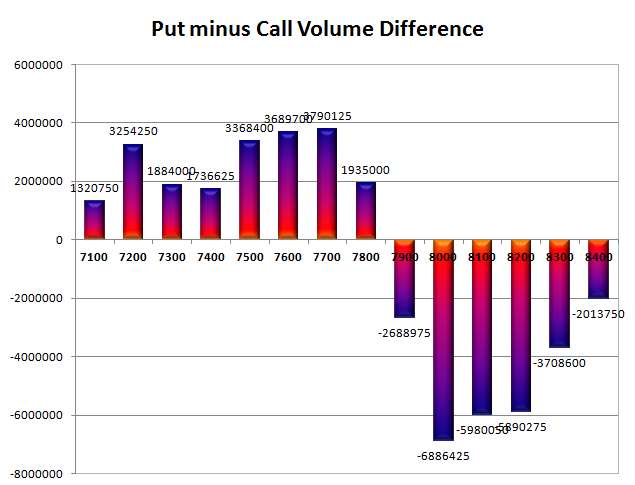 Range for expiry comes to 7900-8000. Call option 7950, 8100 added 20.52 lacs OI with short covering at 7900 and below strike prices. Put option 8000-7800 added huge 58.22 lacs OI with profit booking at 7700 and below strike prices. 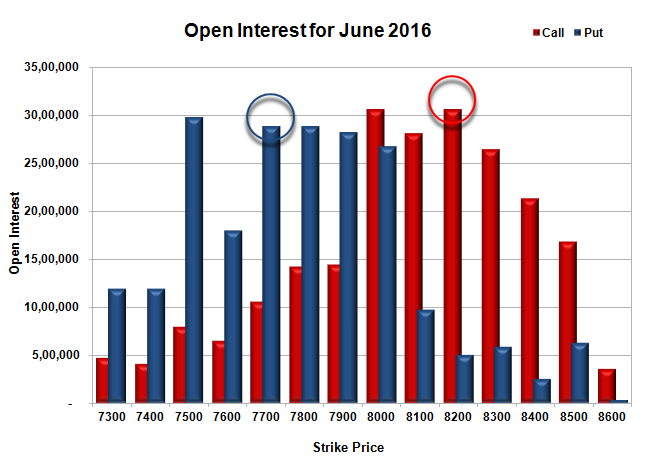 Nifty Open Interest is at 1,15,06,050 down by 21,61,125, whereas June series added 62.31 lacs with increase in price, probably 100% roll-over with huge long build-up. 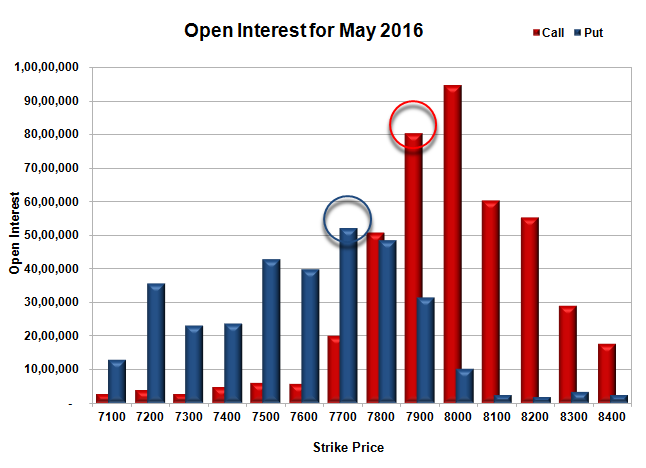 Bank Nifty Open Interest is at 11,19,900 down by 2,84,670, whereas June series added 5.09 lacs with increase in price, probably 100% roll-over with huge long build-up. 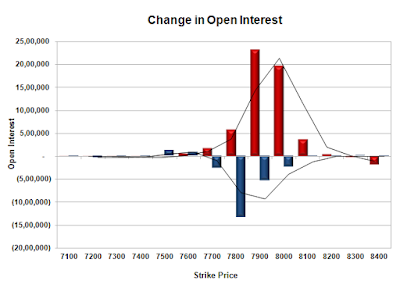 FII’s bought huge 58209 contracts of Index Futures, which includes net 69968 contracts long build-up and 11759 contracts short build-up, with increase in net OI by 81727 contracts, includes 190077 longs to 131868 shorts for the day. FII’s Index future open contract as on date is 227697 Longs to 157144 Shorts, Net 70553 up by huge 58209 contracts. 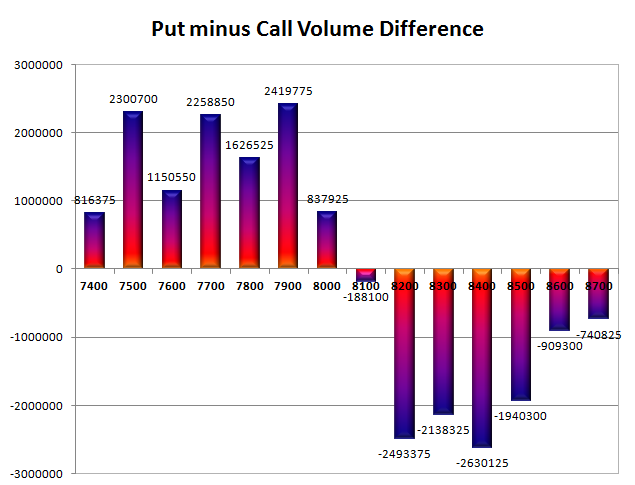 Initial and best support at 7900, with OI of 58.29 lacs and below that at 7800 with OI of 58.11 lacs. 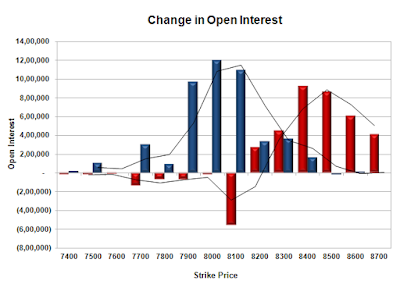 Initial resistance at 7950, with OI of 28.65 lacs and above that at 8000 with highest OI of 78.10 lacs. Day Range as per Option Table is 7833 - 7982 and as per VIX is 7870 - 7999 with 7895 as the Pivot. 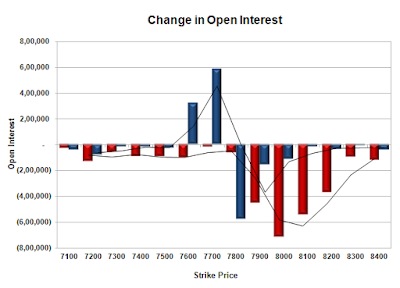 The index opened flat to positive and stayed in a narrow range only to strong buying around the dying minutes to close near the highs of the day at 7748.85, gain of 17.80 points. 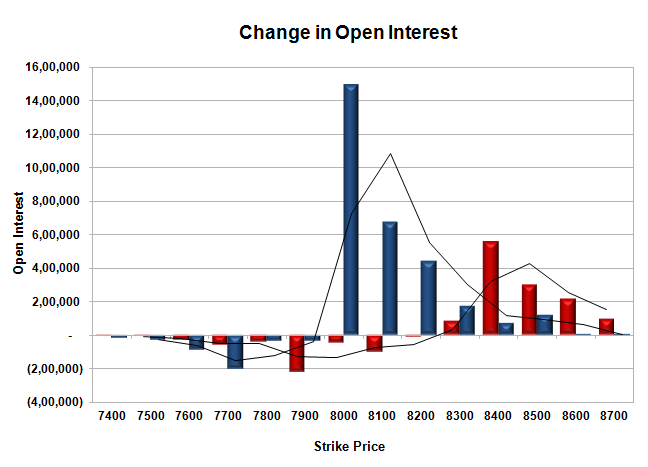 The broader market though was weak with 492 advances to 1075 declines. 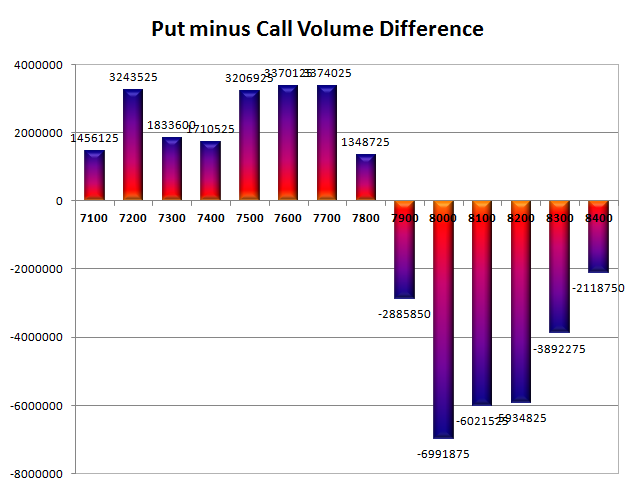 Range till expiry comes to 7700-7900. 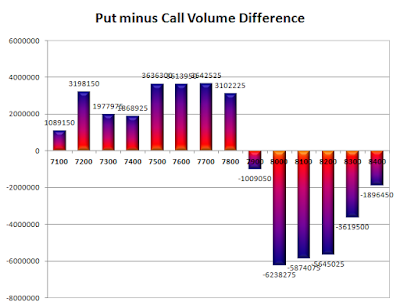 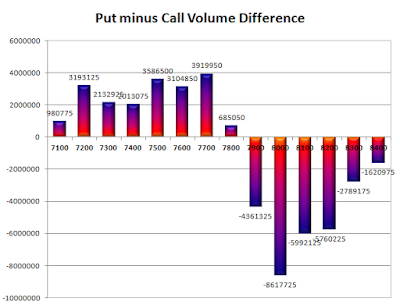 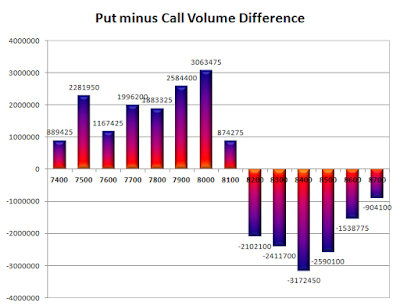 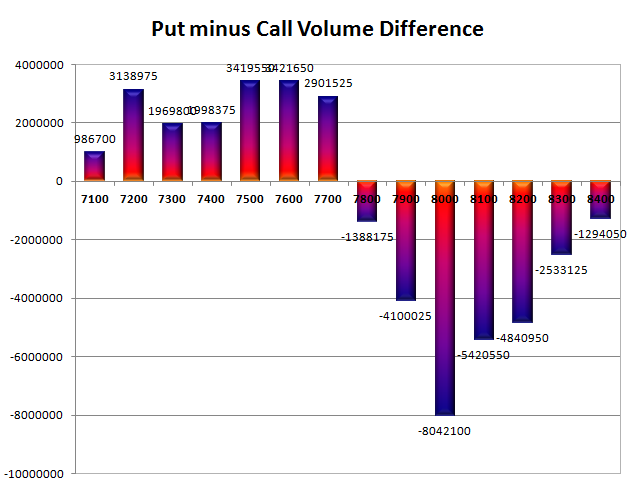 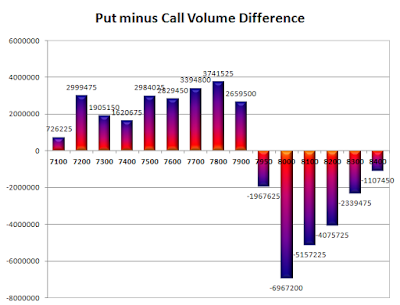 Call option did not add any OI with profit booking at 7900 and above strike prices. 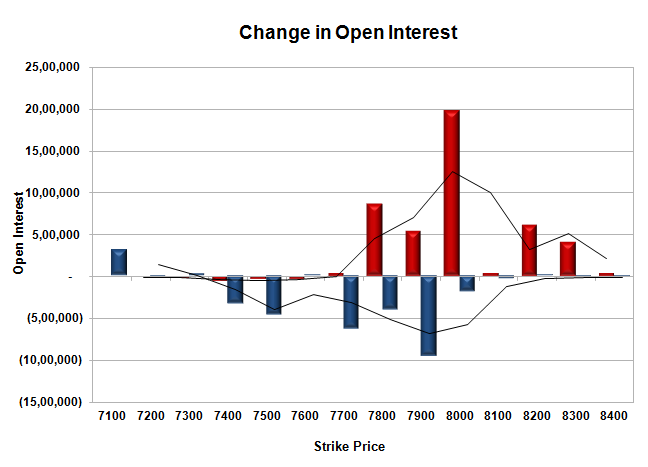 Put option 7700-7600 added 9.08 lacs OI with short covering at 7800 and above strike prices. 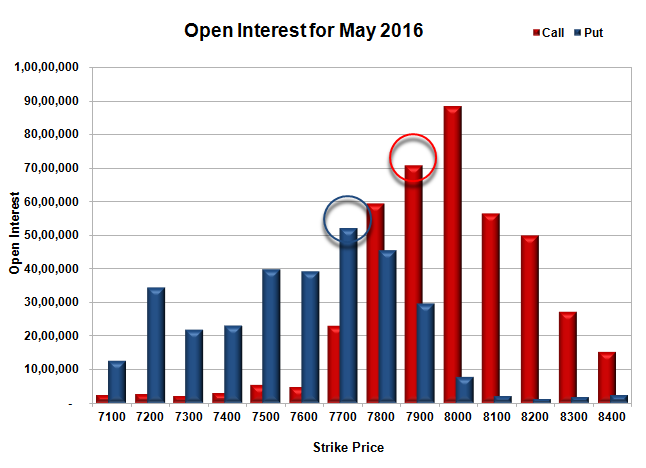 Nifty Open Interest is at 1,36,67,175 down by 9,52,800, whereas June series added 21.81 lacs with increase in price, probably 100% roll-over with huge long build-up. Bank Nifty Open Interest is at 14,04,570 down by 1,66,560, whereas June series added 2.22 lacs with increase in price, probably 100% roll-over with long build-up. 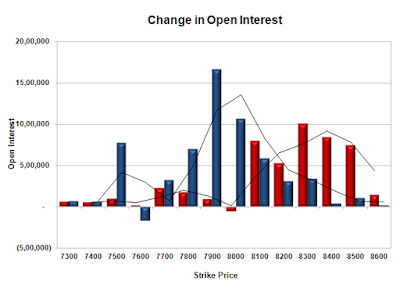 FII’s sold 6620 contracts of Index Futures, which includes net 9333 contracts long build-up and 15953 contracts short build-up, with increase in net OI by 25286 contracts, includes 92030 longs to 98650 shorts for the day. 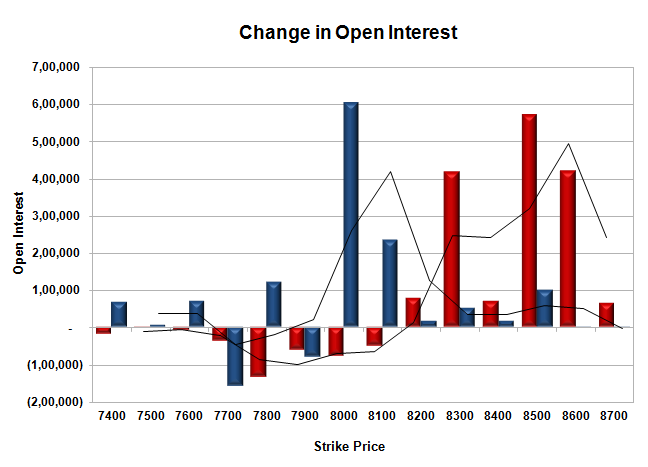 FII’s Index future open contract as on date is 157729 Longs to 145385 Shorts, Net 12344 down by 6620 contracts. 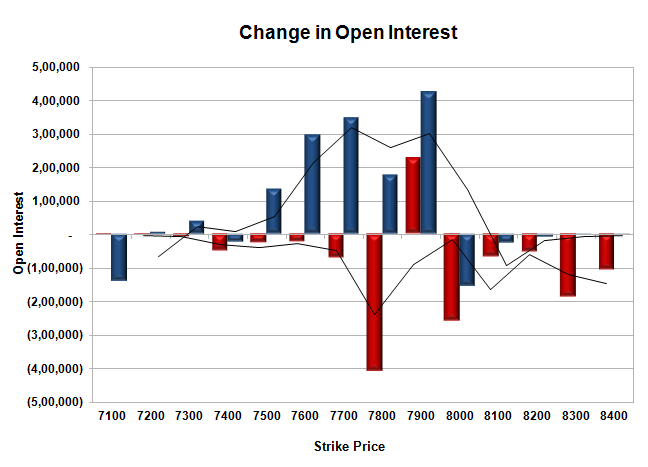 Initial and best support still at 7700, with OI of 57.92 lacs and below that at 7600 with OI of 42.30 lacs. 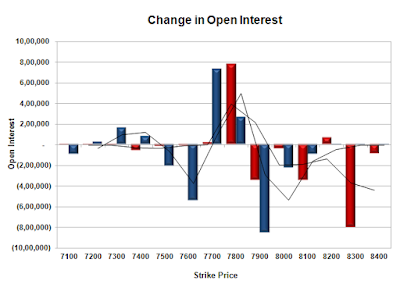 Initial resistance at 7800, with OI of 58.65 lacs and above that at 7900 with OI of 66.22 lacs. 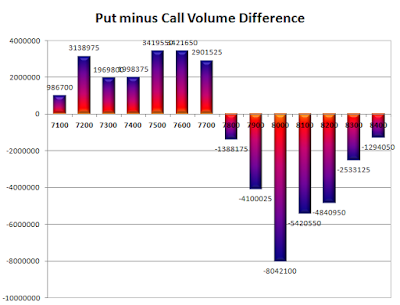 Day Range as per Option Table is 7682 - 7806 and as per VIX is 7683 - 7815 with 7742 as the Pivot. 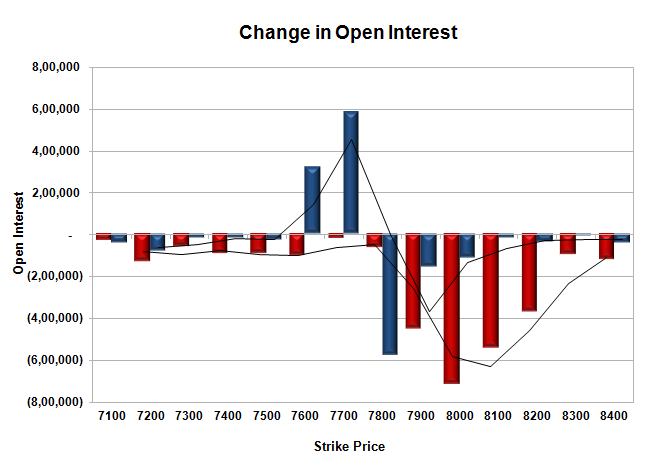 The index opened strong above 7800 but saw huge liquidation from the onset to close near the lows of the day at 7731.05, loss of 18.65 points. 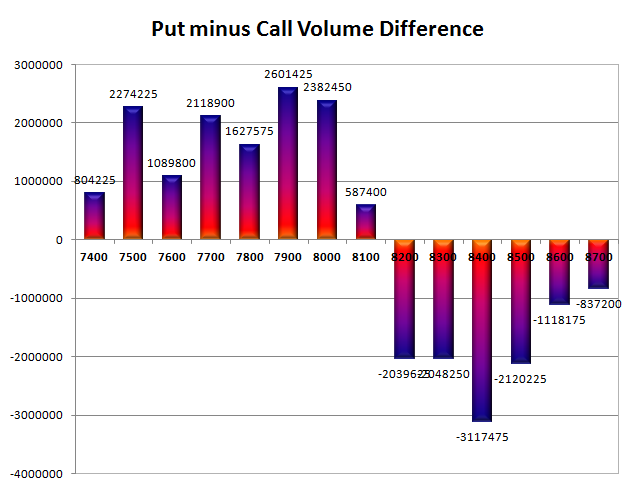 The broader market was weak with 587 advances to 982 declines. Range till expiry comes to 7600-7900. Call option 7700-7800 added 11.63 lacs OI with profit booking at 7900 and above strike prices. Put option 7700 added 0.06 lacs OI with short covering at 7800 and above strike prices. Nifty Open Interest is at 1,46,19,975 down by 10,05,975, whereas June series added 28.21 lacs with decrease in price, probably 100% roll-over with huge short build-up. 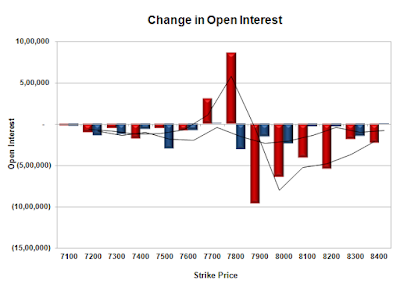 Bank Nifty Open Interest is at 15,71,130 down by 83,610, whereas June series added 0.63 lacs with decrease in price, mostly roll-over with small long liquidation. 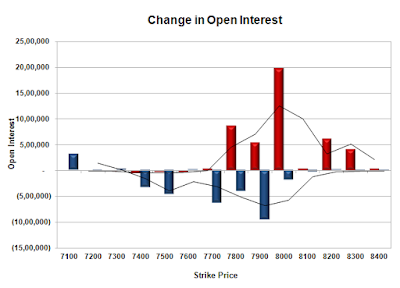 FII’s bought 6015 contracts of Index Futures, which includes net 9689 contracts long build-up and 3674 contracts short build-up, with increase in net OI by 13363 contracts, includes 70830 longs to 64815 shorts for the day. 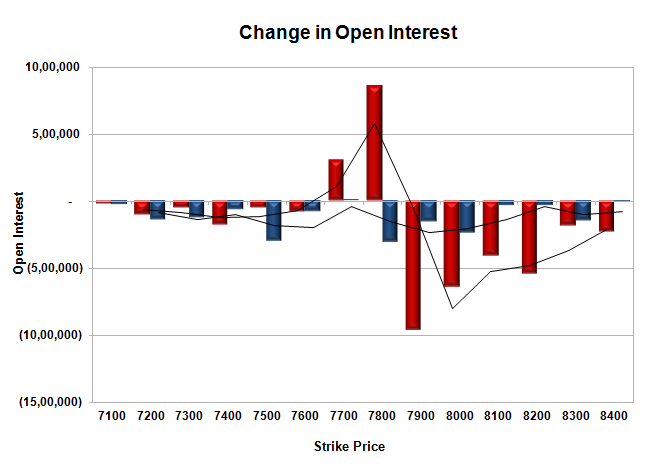 FII’s Index future open contract as on date is 148396 Longs to 129432 Shorts, Net 18964 up by 6015 contracts. 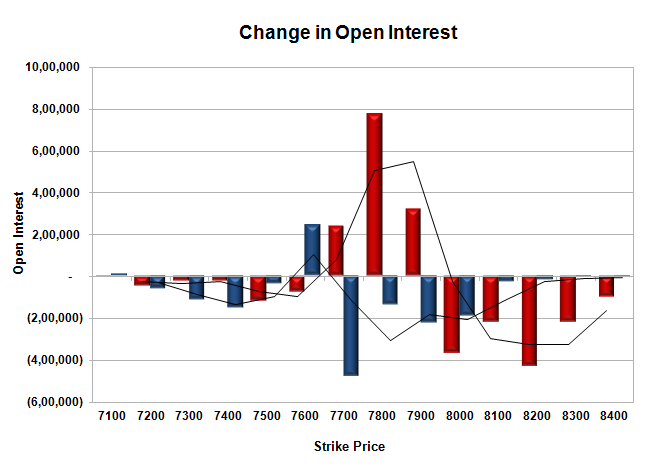 Initial and best support still at 7700, with OI of 52.06 lacs and below that at 7600 with OI of 39.08 lacs. Initial resistance at 7800, with OI of 59.32 lacs and above that at 7900 with OI of 70.73 lacs. Day Range as per Option Table is 7685 - 7819 and as per VIX is 7666 - 7796 with 7758 as the Pivot.